June is the month for Gemini, The Twins. Geminis are often known for their basic versatility and intelligent, yet airy, nature. Right brain, left brain. Thinkers, doers. Dreamers, realists. Beth Athanas, who happens to be my sister, is the June Artist of the Month. The Gemini duality helps describe Beth, who will be celebrating a big birthday this week! Being the twin personified, Beth excels in many areas. She's smart and physical. Talented in the arts, the books and the muscle. While skydiving is her love, she is also a talented painter, award winning baker and jewelry maker. Her area of concentration, kinesiology, has lead her to a career as a Performance Enhancement Specialist. And, also lead her to design and create her signature jewelry, the 3-Ring Necklace. While I'm not a skydiver myself, I truly appreciate the intricate detail of the 3-Ring Necklaces. The different colors, designs and textures the necklaces embraced are endearing in their uniqueness. The design is vaguely Celtic, vaguely modern, vaguely weird, vaguely familiar, and at the same time, all inviting. Read on to find out why and how Beth decided to push her jumping passion toward a more creative outlet. A~ I started skydiving in 1999. One day I saw that I had three keychain rings of differing sizes. I decided to make them into a necklace that resembled the 3 ring release system on skydiving rigs. I was wearing the necklace in the packing room when a girl mentioned that she liked it, and asked if I sold them. I said no, but she planted a seed in my brain that didn’t sprout until years later. When I was in graduate school and suffering financially, I decided to start making the necklaces to make some money. After I graduated, I continued out of pleasure. A~ Skydiving is a sport for non-conformists. 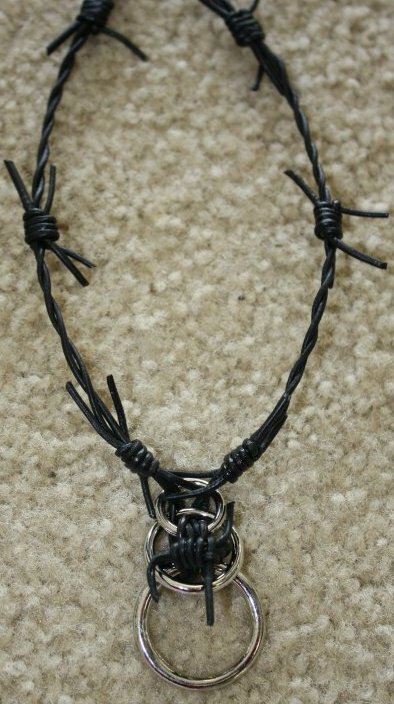 The closing pin necklace is very popular in skydiving, but it seems to me that people who are wearing them are conforming! Q~ What is a great success story? A~I was thrilled when some top skydiving gear companies placed some orders to sell in their gear shops. 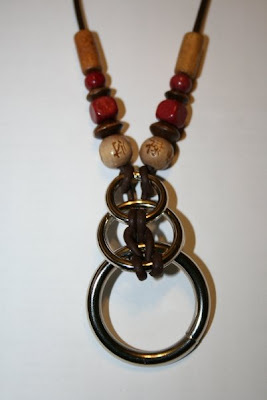 It is always wonderful when I come across someone and they are wearing the 3 Ring Necklace! A~ When I first started making the necklaces, I need a wholesale ring supplier. I found a crafting company in Canada and placed some orders with them. Unfortunately, their poor shipping standards and horrible customer service forced me to find another supplier. My current supplier is awesome; I just hope they stay in business! A~ I get my inspiration from the incredible experience of jumping out of airplanes. Skydiving is source of empowerment, something that a lot of people need in their lives. I would not be the same person today if I was not a skydiver. A~ I make what I do because I believe in my product. I think it truly is a beautiful necklace that represents something wonderful. I love sharing that with other people. A~ I do most of my selling online. 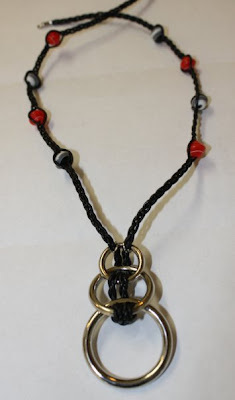 I love vending in person because I get to meet people and they get to design their own necklace. They create ownership of the necklace and they are more likely to wear it if they like it. It bugs me when people buy the necklace but don’t wear it. A~I love meeting new people and making connections. A~I dislike when people make excuses why they don’t like the necklace. They say things such as, “It is too bulky,” (I make a mini three ring necklace as well) or “I don’t wear jewelry.” Not everyone is into the necklace because they are bigger than the closing pin necklaces. A~ My goal is to be sold by every skydiving gear supplier. I want the necklaces to be just as popular as closing pin necklaces. Also, I want to be able to sponsor a skydiving team, but I don’t make that much money! A~ I live in Killeen, Texas because I work at Fort Hood for my full time job. A~I would live somewhere warm where I could skydive all year round, make good money, be close to my family, and be close to my boyfriend. That place has yet to exist!!! A~ Where do you jump? A~ Right now I’m not jumping because of my injury, but I’m working manifest until I heal up. A~ What do you mean? And African or a European swallow? 3 Ring Necklaces can be custom ordered at 3ringnecklace.blogspot.com. 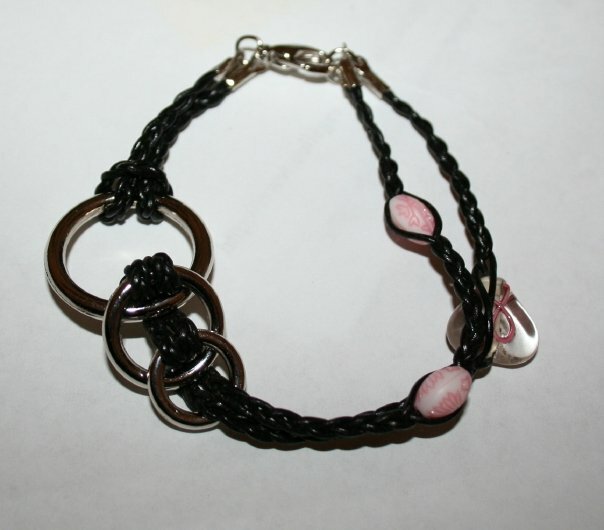 Chooses from all different colors, sizes, types of leather cording and length. Get a completely unique necklace, from a completely unique type of artist. Also, you can friend 3 Ring on Facebook and keep up to date about new retail locations and styles.